《μ'sの聖誕物語》是一款Xperia機型專用主題，適用於索尼Xperia智慧型手機（建議安卓6.0版本以上）。（加入大量特效，佔用資源較大，使用前請做好心理準備）μ'sChristmas Theme is made for Xperia devices. (Better compatibilitywith Marshmallow 6.0 and above. )Xperia™themes可真正實現Sony裝置的個人化。下載專屬主題，享受完美的整合體驗。Xperia™ theme is a new wayto make your Sony Xperia™ device truly personal.Download gorgeousand high quality themes developed uniquely for your Xperia™smartphone.Theme changes almost all assets and is very easy touse. "Μ's の Christmas Story" is a special model Xperia theme forSony Xperia smartphones (Android 6.0 or later isrecommended). (Adding a lot of special effects, take up moreresources, please be psychologically prepared before use)μ'sChristmas Theme is made for Xperia devices. (Better compatibilitywith Marshmallow 6.0 and above. )Xperia ™ themes can be trulypersonalized Sony device.Download the exclusive theme, enjoy theperfect integration experience.Xperia ™ theme is a new way to makeyour Sony Xperia ™ device truly personal.Download gorgeous and highquality themes developed uniquely for your Xperia ™smartphone.Theme changes almost all assets and is very easy to use. 《西木野真姬》是一款Xperia機型專用主題，適用於索尼Xperia智慧型手機（建議安卓5.1版本以上）。Nishikino MakiTheme is made for Xperia devices. (Better compatibility withLollipop 5.1 and above. )鳴謝（Thanks toyou）：桌布（Wallpaper）：http://www.deviantart.com/art/Maki-Nishikino-V3-Love-Live-Minimalist-605921485鎖定（Lockscreen）：http://lucifer012.deviantart.com/art/Maki-Nishikino-Love-Live-Minimalist-542215574圖示（Icon）：ByKach AgainXperia™ themes可真正實現Sony裝置的個人化。下載專屬主題，享受完美的整合體驗。Xperia™theme is a new way to make your Sony Xperia™ device trulypersonal.Download gorgeous and high quality themes developeduniquely for your Xperia™ smartphone.Theme changes almost allassets and is very easy to use.關鍵詞（Keywords）：Nishikino Maki 西木野真姬西木野真姫 ラブライブ！ LoveLive! 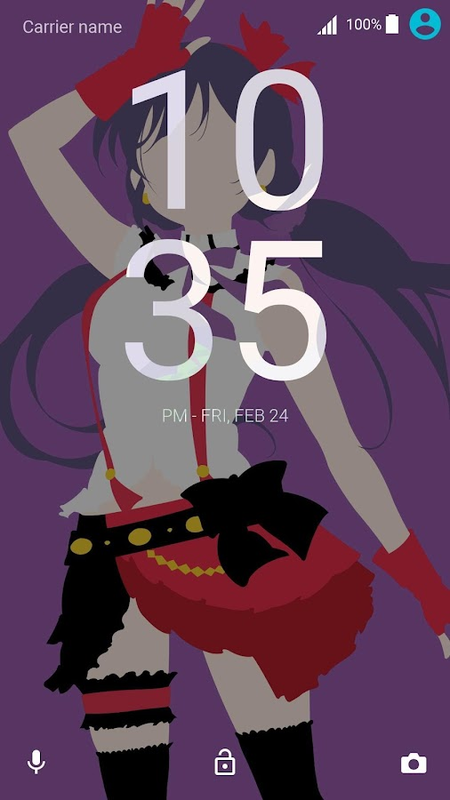 "West Kino Hypsizigus" Xperia model is aspecial theme for Sony Xperia smartphones (Android 5.1 or later isrecommended).Nishikino Maki Theme is made for Xperiadevices. (Better compatibility with Lollipop 5.1 andabove. )Acknowledgements (Thanks to you):Wallpapers (Wallpaper):http://www.deviantart.com/art/Maki-Nishikino-V3-Love-Live-Minimalist-605921485Lock(Lockscreen): http://lucifer012.deviantart.com/art/Maki-Nishikino-Love-Live-Minimalist-542215574Icon(Icon): By Kach AgainXperia ™ themes can be truly personalized Sonydevice.Download the exclusive theme, enjoy the perfect integrationexperience.Xperia ™ theme is a new way to make your Sony Xperia ™device truly personal.Download gorgeous and high quality themesdeveloped uniquely for your Xperia ™ smartphone.Theme changesalmost all assets and is very easy to use.Keywords (Keywords):Nishikino Maki Nishiki Nishiki wild wild Hypsizigus true Hime LITEra bu bu! LoveLive! 《SONYUXP》是一款Xperia機型專用主題，取材自索尼经典UXP风格，適用於索尼Xperia智慧型手機（建議安卓5.1版本以上）。SONY UXP Theme is made for Xperia devices. Based on SONY classicUXP style. (Better compatibility with Marshmallow 6.0 and Lollipop 5.1)Xperia™ themes可真正實現Sony裝置的個人化。下載專屬主題，享受完美的整合體驗。Xperia™ theme is a new way to make your Sony Xperia™ device trulypersonal.Download gorgeous and high quality themes developed uniquely foryour Xperia™ smartphone.Theme changes almost all assets and is very easy to use. "SONY UXP" Xperia modelis a special theme, taken from Sony UXP classic style, for SonyXperia smartphones (Android 5.1 or later is recommended).SONY UXP Theme is made for Xperia devices. Based on SONY classicUXP style. (Better compatibility with Marshmallow 6.0 and Lollipop 5.1)Xperia ™ themes can be truly personalized Sony device.Download the exclusive theme, enjoy the perfect integrationexperience.Xperia ™ theme is a new way to make your Sony Xperia ™ device trulypersonal.Download gorgeous and high quality themes developed uniquely foryour Xperia ™ smartphone.Theme changes almost all assets and is very easy to use. Official Taken with Xperia III theme for Sony XPERIA™Tested onXperia Devices XZ1, X, X Performance, Z5, Z5 Compact, Xperia Z4Tablet, Xperia XA1 etc.SpecificationsXPERIA™ Themes can customizeover 300 graphical assets.Style everything from lock screen andhome screen wallpapers to icons, colours and buttons.RequiresAndroid 5.0 and aboveDownload gorgeous and high quality themesdeveloped uniquely for your Xperia smartphone from Sony Mobile.Download your favourite theme and personalize your phone today! Official catalog of themes for your smart phone or the Sony Xperiatheme tablet.Choose the best themexperia for your android devicewith us!The catalog contains the most high-quality threads iconpack for official launcher Xperia Home.Our catalog combines thecreation of the best developers in the world!We have implementedthe most convenient choice of quality and the possibility ofdownloading from official sources.Do you want to receive freePremium xperia theme? Adds to our official pages on socialnetworks, and the first to learn about free promotional codes onhot new products.FacebookG +Features:❖ Free and paid themes withiconpack for sony xperia❖ Compatible with the entire product line:Z (z1, z2, z3, z5), M, C, X, ZX and compact version of thesmartphone.❖ All themes have been tested and are compatible withdifferent versions for Android: Kitkat 4.4, Lolipop 5.1.1,Marshmallow 6.0.1, Nougat 7.0❖ Absolutely FreeThe differencebetween our topics:+ High-quality HD graphics of all elements+ Fullstudy of all the elements (more than 270)+ One of the officialregistration of the launcher sony (background, lock screen, systemlayout, buttons, switches, in theme with embedded icon pack xperiaand keyboard)+ EXp theme for xperia is good for New Sony XperiaLine X Performance, X, XA and full Z line.Please support us byratings and reviews. Your feedback will help us make the app XperiaTheme Catalog X even better!We are always happy to help find thebest theme. Sony Best Quality Wallpapers Collections is here download nowXperiaZ2 Xperia Z3 Xperia Z3 Plus Xperia Z5 it is a Free ApplicationDon'tneed a internet connection its a offline app just download andenjoy it now !! !We Make All Wallpapers for your smartphoneHow touse:Step1.Open the App Step2.Tap on OpenStep3.Tap the wallpaperSymbols to Choose wallpaperStep4.Then set wallpaper See Easy to Usetry it nowPlease Review,Rate it for Improvement of theappSamsung,Nokia,LYF,Vodafone,LeTv,Micromax,Lenovo,Gionee,Vivo,Motorola,Oppo,Xiaomi,Alcatle,AsusZenfone,Huawei and others Android smartphones support this app. Official Toucan theme for Sony XPERIA™Tested on Xperia Devices Z5,Z5 Compact, Xperia Z4 Tablet, Xperia Z3 etc.SpecificationsXPERIA™Themes can customize over 300 graphical assets.Style everythingfrom lock screen and home screen wallpapers to icons, colours andbuttons.Requires Android 5.0 and aboveDownload gorgeous and highquality themes developed uniquely for your Xperia smartphone fromSony Mobile. Download your favourite theme and personalize yourphone today! Official STAR WARS Battlefront II theme for Sony XPERIA™Tested onXperia Devices XZ1, X, X Performance, Z5, Z5 Compact, Xperia Z4Tablet, Xperia XA1 etc.SpecificationsXPERIA™ Themes can customizeover 300 graphical assets.Style everything from lock screen andhome screen wallpapers to icons, colours and buttons.RequiresAndroid 5.0 and aboveDownload gorgeous and high quality themesdeveloped uniquely for your Xperia smartphone from Sony Mobile.Download your favourite theme and personalize your phone today! Official Taken with XPERIA™ II theme for Sony XPERIA™Tested onXperia Devices XZ1, X, X Performance, Z5, Z5 Compact, Xperia Z4Tablet, Xperia XA1 etc.SpecificationsXPERIA™ Themes can customizeover 300 graphical assets.Style everything from lock screen andhome screen wallpapers to icons, colours and buttons.RequiresAndroid 5.0 and aboveDownload gorgeous and high quality themesdeveloped uniquely for your Xperia smartphone from Sony Mobile.Download your favourite theme and personalize your phone today!